Delta Search engine is an Tool bar or an extension for an browsers. Browsers like Google chrome, Internet explorer, Firefox..etc. It is an unwanted programs which is used to promote their product. Even some e Commercial sites also promote through this extensions. They even display ads and services. This type of promotions are promoted as free downloads, people may download and install them unknowingly. 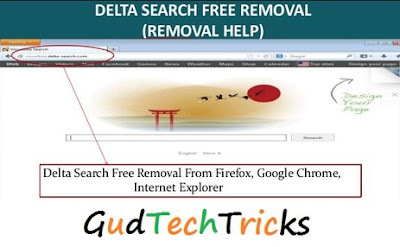 So today i’m here will an tutorial on “How to Remove Delta Search from Google Chrome“. 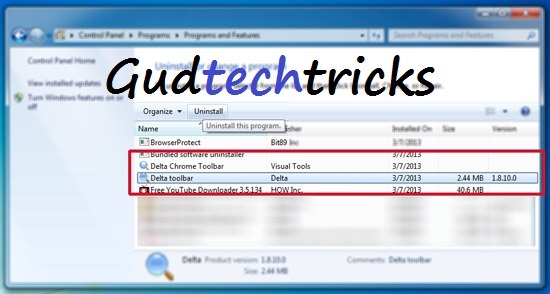 How to Uninstall Delta Search from Chrome. Don’t worry i will explain each and every step to Remove the Delta Search from Chrome or Firefox. Delta Search can’t be removed or Uninstall easily from the browser because it configure windows when it has installed and it can automatically loaded even after the change of system settings. So in order to Delete the Delta Search then follow the steps below. Here you should follow according to the below 2 steps for Deleting it. Don’t forget to Share the Post, Like the Post and Comment the Post. Go to Control Panel>>Add or Remove a Program. Now look for the Delta, Delta Search, Delta Tool Bars or Browser Protects. Now Click on Uninstall. You may find different files regarding Delta search. Remove all those files from your system. The extension page will be opened. Click on the Delete button to delete the extension. Now go to Google Chrome Settings>>Start up>>Set Pages. When set Page is opened. Click on X Button in order to delete the http://www1.delta-search.com/?babsrc=HP_ss&mntrId=F2010CEEE68D2915&affID=121564&tsp=4985. Click on OK.
Now Delete or Remove http://www.delta-search.com/?babsrc=HP_ss&mntrId=38D4000C2905DCD5&affID=119291&tsp=4975 and click on OK to save the changes. Set Google or any Other search as your default Search engines and delete the Delta Search by clicking the X button. Now restart your Google Chrome Browser and now You will not find the Delta search page. That’s it. So simple to Remove Delta Search from Chrome. 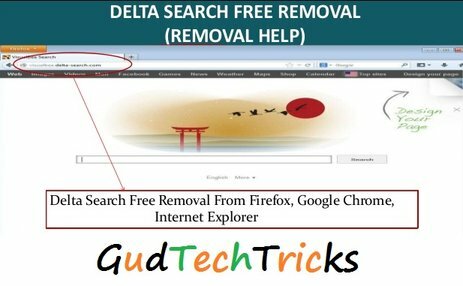 Remove Delta Search from Google Chrome. Remove Delta Search from FireFox. Remove Delta Search from Internet Explorer. Do share the article if it is helpful. Like and comment us. Feel free to ask any questions regarding the tutorial.